(Nanowerk News) From the study of an unusual two-dimensional electron system that is generated on the surface of low-temperature liquid helium, a RIKEN-led international research team has revealed that electrons free of atoms interact more strongly with each other than their counterparts in a semiconductor ("Resonant Correlation-Induced Optical Bistability in an Electron System on Liquid Helium"). The work provides valuable insights into both electron interactions and thin films of so-called ‘two-dimensional free electron gases’, which have useful applications. Low-noise amplifiers in mobile phone base stations, for example, use the electrical characteristics of weakly interacting two-dimensional electron gases in thin-film semiconductor devices. The strong electron interaction observed by the researchers was evident once the free electrons were excited into a higher energetic state by microwave radiation (Fig. 1). “As soon as the first electrons are in the higher state, the strong interaction between electrons in both states means that the energy difference between these two states changes as a result,” comments Denis Konstantinov from the research team. 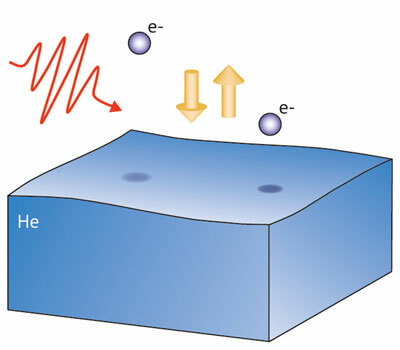 Figure 1: A two-dimensional electron gas on the surface of helium (blue). Microwave radiation (red arrow) can be used to excite electrons into higher states, where their interaction leads to novel effects. This energy shift has been long predicted theoretically, although the weak electron interactions in semiconductors meant that it was too small to be observed. It is the strong electron interactions in the liquid helium system that enabled its detection for the first time. “It is due to its simplicity and extreme cleanness of our system that many theoretically predicted phenomena can be observed,” says Konstantinov. The researchers then ventured to more complex experiments and applied a strong magnetic field perpendicular to the electron gas. This forced the electrons into a number of quantum states. As they increased the magnetic field, the energies of these quantum states shifted towards higher values. Successively, each quantum state changed to match the fixed energy of the higher energy surface state, again induced by the microwave radiation. At the matching condition, the electrical resistance of the quantum states increased owing to the interaction with the surface state. This resulted in characteristic oscillations in the electrical resistance with increasing magnetic field. Konstantinov and colleagues also observed that in this configuration the strong interactions between the electrons can lead to a destruction of the quantum states and therefore to the complete disappearance of the resistance oscillations ("Novel Radiation-Induced Magnetoresistance Oscillations in a Nondegenerate Two-Dimensional Electron System on Liquid Helium").